We proclaim to you the one who existed from the beginning, whom we have heard and seen. We saw him with our own eyes and touched him with our own hands. He is the Word of life. This one who is life itself was revealed to us, and we have seen him. And now we testify and proclaim to you that he is the one who is eternal life. He was with the Father, and then he was revealed to us. We proclaim to you what we ourselves have actually seen and heard so that you may have fellowship with us. And our fellowship is with the Father and with his Son, Jesus Christ. We are writing these things so that you may fully share our joy (1 John 1:1-4 NLT). Some people are amazing. These special people take profound ideas and make them seem simple. They can take complex sentences and reduce them to short phrases of clear thought. They use an economy of words to communicate eternal truth. Our LORD God Almighty is the master at making the profound feel simple. For example, look at the birth of Jesus. The eternal God comes to us as a baby wrapped in strips of cloth lying in a manger. We can clean up the acronym K.I.S.S. to mean, “Keep It Short & Simple!” I believe this thought nails the concept God wants us to achieve with our faith. The challenge of being a disciple should not be in trying to understand the truth. Living truth should be our challenge. Jesus came to make the profound simple, the complex doable, and the eternal touchable. He wants us to do the same. He wants us to celebrate the profound made simple, the complex made doable, and the eternal made touchable. Holy Communion is one of our most important examples. 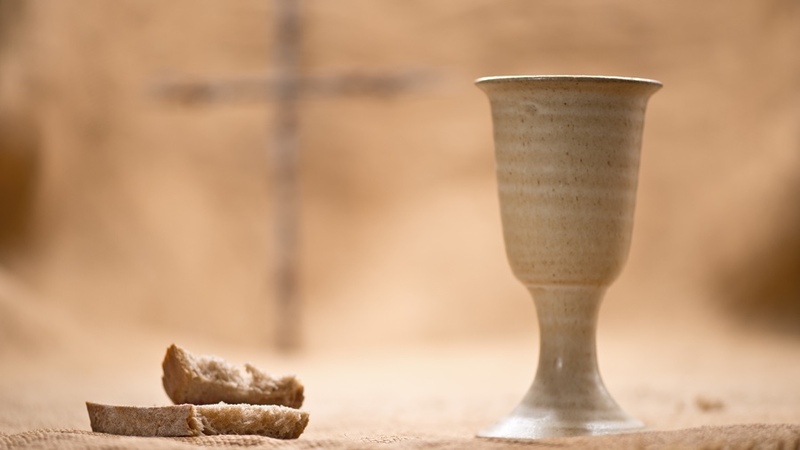 Communion is a simple celebration of God’s profound truth that brings us life. We come to The Table to share a common joy. We have very simple things that draw us into the deep grace of God and the eternal truth that walked among us. We move beyond bread and wine into the gift of life that we can see, smell, taste, and touch. We are caught up in sensory fellowship with Jesus and with each other. We share in his death, burial, and resurrection as we remember his costly gift and anticipate his coming again. We do this together on the day of his resurrection, Sunday, the first day of the week, the Lord’s day. God loves us and gave us the gift of life through Jesus’ death. Jesus ransomed us from sin, death, and hell through his resurrection from the dead to give us life. The Spirit binds us together as we remember and anticipate our Savior’s return. With simple bread and wine, we experience the profound and inexplicable redeeming love of our eternal God who became flesh. K.I.S.S. Keep it short and simple! Almighty God, thank you for placing the gift of life into our hands. As we take this bread, we remember your love, Jesus’ sacrifice, and our fellowship through the Holy Spirit. We thank you for giving us grace through the simple gifts of bread and wine we take together. In Jesus’ name, we thank you. Amen. Holy Father, thank you for making the profound simple, the complex doable, and the eternal touchable in this simple meal. In Jesus’ name, I pray. Amen. Special thanks for the use of the Jesus images in this series of posts about The Lord's Supper, "Beyond Bread and Wine" to Free Bible Images and the The Lumo Project. "Making the Profound, Simple" by Phil Ware is licensed under a Creative Commons License. Heartlight encourages you to share this material with others in church bulletins, personal emails, and other non-commercial uses. Please see our Usage Guidelines for more information.